Wargamers are aware that Derby World Wargames has gradually been moving south – from Derby itself, to Donington Park, and then Bruntingthorpe Proving Ground, Lutterworth. Organiser Daryl of KR Multicase has a three-year rolling schedule for the worlds at a particular venue, and at Colours 2017 Fighting 15s talked to Daryl and put forwards its own garage and garden as a spacious venue with a view to hosting the event in 2020. Hosting Derby Worlds on the Isle of Wight will, of course, avoid the inevitable slip down the country to London and the Excel centre and prevent it becoming “The Other Salute”, and mean the event will go as far directly south as it can in the UK without everyone getting their feet wet. A location on the sunshine Isle means there is no fear of rain in October – it only rains on the Island when there is a music festival – and an outdoors event is possible in the clement weather. The bucolic surroundings of Fighting 15s mean that those gamers who long for the heady smell of farm animals and agricultural machinery from Donington Park can experience nature itself, red in tooth and claw, just along the farm lane from Fighting 15s. Don’t forget your bucket and spade. For details, phone 01983 010418. Fighting 15s will be on the Colonel Bill’s stand (TD19) at Salute, Excel London, on 14 April 2018. Please note that the closing date for advance orders for the show is 1 April. I am unavailable in the week or so running up to Salute and have to cut-off advance orders early this year. Advance orders may be made by phone, email (please don’t send attachments) or by sending a message via the Fighting 15s Facebook page. Fighting 15s can no longer offer a collect at Salute option in the shopping cart because of a change in how the shop’s delivery system works. Payment must be in advance by card or PayPal: at Salute, Ian will be in Colonel Bill’s livery and operating Colonel Bill’s till and Fighting 15s cannot, therefore, take cash payments on the day. Colonel Bill’s is Fighting 15s’ official stockist of Eureka 18mm SYW figures and Fighting 15s’ medievals. In addition to our lines that Colonel Bill’s usually carries, there will be a selection of Napoleonic unit packs of 15mm AB Figures at the show. Packs on the stand are based on our best-sellers, and by its nature the selection will therefore be limited. Orders for 20mm WWII AB Figures must be made in advance. Advance orders for collection at Salute may also be made for our clearance lines of Oddzial Osmy, Shadowforge and Laughing Monk figures. These ranges, however, will be removed from the Fighting 15s shop on 1 April. Eureka Miniatures has its own, separate stand at Salute. Please do not confuse it with Fighting 15s when placing advance orders. Fighting 15s will be at Salute 2017 on 22 April on Colonel Bill’s stand (TD21) along with a selection of 15mm AB Napoleonics. AB Figures available on the day will include infantry unit packs for the major nations. This is an experiment for Fighting 15s. Salute used to be possible only with the help of Mike of Black Hat Miniatures, but now he has stopped attending events, shows – particularly Salute – have proved unmanageable. For the past year Colonel Bill’s has been taking a number of our products on the UK shows circuit – Eureka Miniatures’ 18mm Seven Years War figures, our own 15mm medievals for Tannenberg 1410, and playing cards by Bartek – and this year we have decided to help out by signing on with Colonel Bill’s crew for the day. Attending in person allows Fighting 15s to bring AB Figures to a show. Fighting 15s intends to repeat this at Carronade in Falkirk on 13 May – we will again be present on the Colonel Bill’s stand – after which we will take a view on the experiment’s success and consider repeating it for the late summer and autumn show schedule and expanding the available range of packs. After a year of no events it is taking time to build up to having stock suitably packaged for shows. Bear with us. Advance orders for collection at Salute or Carronade can be made via Fighting 15s by phone or email. 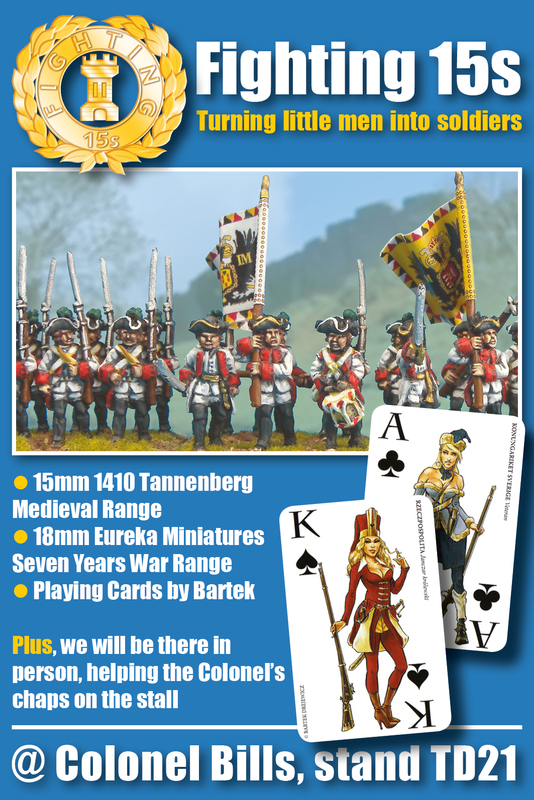 Time is running out for advance orders for Salute – Wednesday 19 April is about as late as is possible. Fighting 15s can take advance orders for all the ranges it supplies – but please support Colonel Bill’s by buying the SYW basics from them. As usual, Nic Robson of Eureka Miniatures is present at Salute on his own, heavily manned stand (TH20), with the new releases from both Eureka Miniatures and AB Figures. Don’t forget to say hello to him as well. Because of licensing agreements, Fighting 15s may have AB Figures only at shows at which it is physically present. Colonel Bill’s is not able to have AB Figures at shows at which Ian of Fighting 15s is not present – we are dealing with this by aiming to attend a few more shows in person this year. All figures from Fighting 15s are packaged in blisters in the distinctive colours of Fighting 15s (gold badge on a blue background) and clearly labelled as to the manufacturer and contents. All figures supplied by Fighting 15s on the Colonel Bill’s stand are cast in lead-free pewter. Fighting 15s is at Carronade in Falkirk on Saturday 7 May. Carronade is Fighting 15s’ only show as a trader in 2016, and Ian uses the trip to Scotland to take a short holiday to visit castles, museums, steam railways and whisky distilleries, to enjoy Scotland in the springtime, and to keep in touch with his customers in Scotland. As a result, Fighting 15s does not intend to take stocks of figures to Carronade. He will definitely carry Coat d’arms paints and Fighting 15s’ 15mm flags for the Napoleonic and the Seven Years wars at the show. Advance orders for figures are therefore essential. If, at the last moment, Ian feels stocks of 20mm AB WWII and Eureka 28mm moderns are up to surviving the show, he will take them. The pin-up playing cards by Bartek are available at the show through Colonel Bill’s, Fighting 15s’ representative at UK shows for the cards. Update: Ian has packed the 20mm AB WWII range for the show. Ian will have packed the car by the evening of Wednesday 4 May, is travelling from 5 May, and any advance orders should therefore be with him by noon on Wednesday. Fighting 15s also has planned a trip to see AB sculptor Tony Barton to find out what’s coming next from AB Figures. Fighting 15s itself will be closed from 5 May to 12 May. Orders placed in the online shop will be dealt with on Ian’s return as his two elderly cats and his wife, Janet, will not be able to cope with orders while he is away. Do not expect miracles of wargamerly understanding from the cats or, in particular, Janet. Bartek’s decks of fully illustrated 17th century pin-up girl playing cards, Wild Wild Fields, will be available at Salute through Colonel Bill’s, Fighting 15s’ authorized reseller for the cards at UK wargames shows. Colonel Bill’s has been taking the decks around the UK for us since their release, and Fighting 15s is pleased that Stuart (yes, he’s called Stuart, not Bill) has decided to restock for the UK’s biggest wargames show. Colonel Bill’s is on stand TD19. Salute is on 16 April at ExCel London in the Royal Docks. Please note that Fighting 15s is not trading at Salute. With Eureka Miniatures bringing the ranges that Fighting 15s would ordinarily take to Salute, it is no longer commercially worth Fighting 15s trading at Salute by taking a separate stand. Ian will be present as a paying member of the public, although he will from time to time be on the Eureka Miniatures’ stand as Nic Robson’s EU representative. Eureka Miniatures is on stand TM07. Because Fighting 15s is not trading at Salute, Ian cannot take orders for collection by members of the public, no matter how big or small, and no matter where the transaction takes place. Traders pay a lot for the privilege of attending Salute and it is not fair to undermine them by diverting sales to someone who is not trading. Please do not ask Ian to bring orders up for Salute – he will simply refuse. Please note that Eureka’s deadline for advance orders for Salute for Eureka and AB Figures has passed – it was 16 March. Fighting 15s is at Carronade in Falkirk on 9 May. Packing has started and Ian will be off shortly on the 1,000-mile round trip. Ian cannot take any more advance orders for this show. He will have only Coat d’arms paints and Fighting 15s flags to buy on the day at Carronade. Fighting 15s is now closed until 14 May. Ian is taking holiday in Scotland and Yorkshire as well as attending Carronade. The online shop will remain open during Ian’s absence, and any orders placed online will be dealt with on his return. His wife and daughter will not be able to help with phone queries, should they by chance answer calls to the business line. Fighting 15s is attending only two shows in 2015 as a trader: Salute (25 April 2015, London) and Carronade (9 May 2015, Falkirk). If you want to buy figures at either show you must order in advance – Fighting 15s will have only paints and flags at these shows. Delivery options are available now in the Fighting 15s shop for customers who want to order online and collect at either show. Please note that it can take up to eight weeks to obtain stock from some suppliers, depending on workload, which is why the options are available now. These options will disappear one week before each show. Fighting 15s will be attending Salute in conjunction with Nic Robson of Eureka Miniatures, and with luck our stands will be adjacent this year because we have asked the organiser very nicely. Provided that goes OK, that should end the pilgrimage across the vast hall from Eureka to Fighting 15s. Our usual partner at shows, Mike of Black Hat Miniatures, will not be present. Unfortunately, his chronic fatigue syndrome means that he feels unable to continue doing shows. Fighting 15s, however, will be taking his range of Coat d’arms paints to both shows. The paints will be our main offering at both shows. Our trip to Falkirk for Carronade is also being taken as annual holiday, which is why Fighting 15s is travelling light to this show. The car protested a lot last time on Ian’s excursions to distilleries and castles. Ian will be on his own, and a special discount will be available for anyone prepared to be his coffee and bun monkey for a day.